The Soaps was a sold-out hit last year. This year it’s back as a Fringe fundraiser. It’s soooo funny and the cast makes it look easy, a tribute to their talent and experience (and weird minds). This is improvisation at its best. 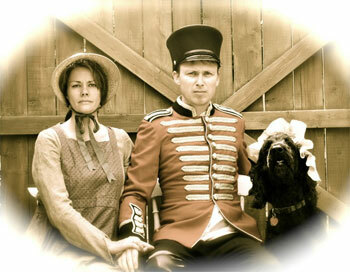 The year is 1812, the setting is York in Upper Canada. I’m not sure whether there is a war on or war is about to break out. It doesn’t matter. Who really cares abut the story (in this context, of course I care about it in real life)?It’s the cast that makes the show. Soap stars Jim Annan (Second City Alumnus, Unlucky), Matt Baram (SC Alumnus, Wingin’ It), Paul Bates (SC Alumnus, Dan for Mayor), Lisa Brooke (SC Alumni, CBC’s The Knowitalls), Christy Bruce (SC Alumni, Private Lives on Broadway), Jan Caruana (About an Hour, Being Erica), Chris Gibbs (Howie Do It, Power of Ignorance), Sandy Jobin-Bevans (SC Alumnus, Life with Boys), Lisa Merchant (Train 48, The Chumps), and special guests each show. There’s really no point in telling you highlights of the show. It’ll be different tomorrow. And apparently I didn’t take a single note I was so caught up in the action and laughing too hard to write. The songs were consistently funny. It amazes me that people are able to improvise songs. Even more amazing that they can improvise duets – or ‘tuets’ as they’re called in the show. Go see The Soaps. You’ll laugh a lot and have a good time and support Fringe while you do it.